Through the years we have recommended some favourite tea rooms, only to return later and sadly, find them either under new ownership, or even closed. Up to now I have usually just been deleting these, but I thought I might instead just move them to a "no longer trading" section in remembrance of what used to be, and perhaps with the thought that they might start trading again, some day. Sadly The Shieling closed in July, 2012. This is what I said when it was open. Please excuse the temporary picture lifted from the Scottish Teapot Trail until I find a picture of my own. Banchory is about 18 miles inland from Aberdeen on the main Deeside road (A93) and has a main street - the High Street - with various shops, pubs, hotels etc - well worth a visit. Heading inland from Aberdeen turn left off the High Street down Dee Street, and The Shieling is about 100 yards down on the right hand side. The address is 18, Dee Street. There is a big pay and display car park opposite, some street parking, or a small free car park to the left at the end of the High Street. The Shieling is a gift shop downstairs worth having a wander round. The tea room is up the stairs to a large room. Teas and coffees are served and there are numerous home baked delights as well as more substantial offerings. The scones are big and tasty - there are lots of kinds of scones -, and the jam seems to be home made and is in a pot on the table - a lot better than a little jar or plastic container. There is a display cabinet at the counter and there are also trolleys with tempting goodies. The Shieling is one of our favourite tea rooms. Whilst in the area be sure to visit the Brig o' Feugh to see the salmon jumping up the Falls of Feugh - continue along Dee Street onto the B974 and the Brig o Feugh is about a mile from Banchory. Alternatively use the lower Deeside road to go from Aberdeen to Bachory and you cross the Brig O Feugh. 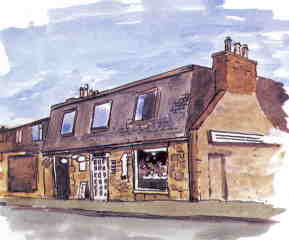 The picture was taken off the Fyfe Arms web site - hope that is OK. The Fyffe Arms Hotel closed for major refurbishment in 2015, reopening in 2018. For comments about Braemar, see Gordons Tearoom and Restaurant. As you enter Braemar the first hotel on the left is the Invercauld, but carry on to the centre of the village and you cannot miss the Fyfe Arms. When a student in Aberdeen more that a few years ago I spent many a happy evening in the bar of the Fyfe Arms, visiting student friends in the area there for the grouse beating - ie student estate holiday work. Usually when we are in Braemar we will have driven up Deeside from Aberdeen, and already have stopped somewhere for morning tea, and probably had lunch too somewhere. So when all we really want when we get to Braemar is just a cup of tea, and perhaps a little biscuit, then it has to be tea in the lounge of the Fyfe Arms - see picture. It's not Claridges, but it is very comfortable, and there are lovely log fires in the winter - and it's a long winter. You get a small, but nice cup of tea / coffee, and a small packed biscuit for a fair price, and its very relaxing just to sit there. When we visited in April 2015 we found that the place was closed, and the windows covered in brown paper - but there were no notices in the window. Then when we visited again in June, 2015 it was obviously closed. To be truthful, I am not too bothered about it closing - yes its sad if someone has fallen on hard times, and it is sad when a place is forced to close. But we haven't really being going there for the last few visits. I liked the tea, and the prices, but Christine didn't like the coffee, and there is no point paying good money for something you don't like. We used to visit Devon at least once a year- and now visit more often, as our daughter and family relocated to Newton Abbot in November, 2010. There are two delightful grand children, Chloe and Alice to visit - need I say any more. Anyway, to return to tea rooms, when in Devon, we usually manage to fit in a visit to Brixham, an historic fishing port, and tourist trap. William of Orange landed here, and Drakes Golden Hind is moored in the harbour. We usually park free beside Battery Gardens on Furzedown Road, then walk down to the shore line through the park, and along and into Brixham. It's not too far to walk, but is a mix of steep paths and steps, so it's best avoided with a pushchair or wheelchair. When in Brixham we used to have a cup of tea in The Teapot Cafe - a tiny little cafe off an alleyway from the harbour. If you stood looking towards the harbour with the statue of William of Orange in front of you, turned round, and went up the alley you then saw opposite you, The Teapot Cafe was on the left at the end of the alley. I must admit there was nothing very special about this particular cafe. It was very small - only about three tables inside, one at the door, and two higher up in the warm beside the ordering hatch. But the prices were very fair, and you got a good cup of tea, and a tasy scone, or cake, or whatever. There were probably better cafe's in Brixham, but The Teapot Cafe was a charming little place that deserved to be kept going. I like to support small local traders whenever I can, and so recommended this place. Sadly, my recommendation made no difference to the fortunes the place, and it closed about August, 2011. It was next called The Dolphin, but The Dolphin was a bit of a disappointment, so I had to recommend somewhere else. The Lemon Heaven cafe is the one I recommend now. Don't confuse it with the Lemon Tree cafe on the main street - although this is quite a good cafe, and it has a nice enough upstairs with a "roof garden" at the back. 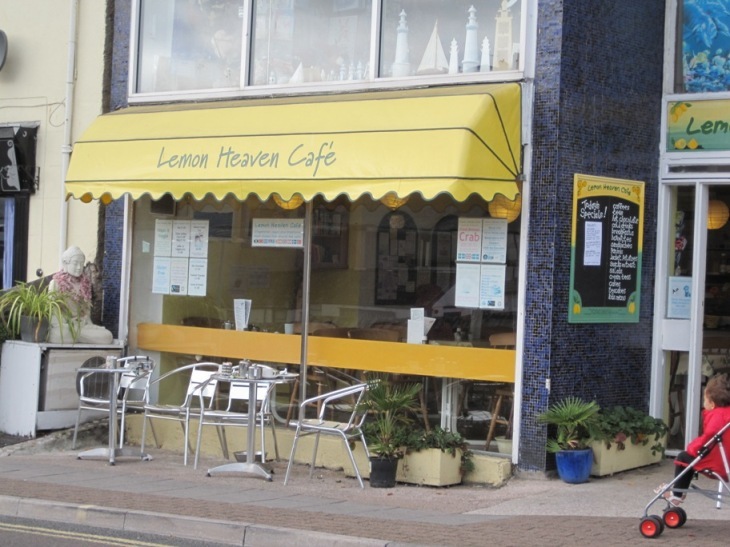 The Lemon Heaven Cafe is on a continuation of the main harbour street. Walk along this street with the harbour on your left and shops on your right, go up the hill at the end, and after a couple of hundred yards you will come across the Lemon Heaven Cafe on your right. This is a nice homely place with good quality, home cooking, and fair prices - it is little off the beaten track, but it's still fairly central and it's an interesting walk to get there. Date of last visit : 2014, but still there in early 2015. Sadly Lynams closed at the end of January, 2013. This picture was taken in November, 2011 when we were on holiday in Australia. The little chap in the bottom left of the picture is my grandson Lachlan, at the age of one year and a few days. Lynams is my first recommended overseas tearoom. I had thought to open a separate section for overseas tea rooms, but as there is only one at present, I will wait a wee while before doing this. Since my son emigrated to Sydney, Australia we have been regular visitors to Oz. In Sydney the place we liked best for tea was a little outdoor cafe up Nurses' Walk near The Rocks called the Gum Nut. This was a delightful place, and I was going to recommnd it, but alas it closed ! I guess if we were going to recommend anywhere, we would recommend having tea in the QVB - the Queen Victoria Building - at the top of George Street. This is a lovely layered building with lots of galleries and some very expensive little shops. Sit at a table on the gallery and watch the world go by. When in Australia we are usually based in Sydney, but spend a week in Brisbane, and have weekend and assorted visits to Jamie and Jacqui's farm near Bigga. You'll have difficulty finding Bigga on a map, but it's about 2.5 to 3 hours inland and south west of Sydney. The route goes out of Sydney to Goulburn, then head towards Crookwell, then carry on through Binda, and eventually you get to Bigga. There is not a lot in Bigga, but there is a pub, a golf club house open at weekends for drinks and great value meals, and a village stores where you can get tea and biscuits served by Helen, a good source of local news. Helen serves "the best ice cream" in all Australia - perhaps a bit of an exageration, but its usually scorching hot when we visit Bigga, and Helen's ice cream is always a treat. But what of Lynams ? Crookwell is just over 2 hours south west of Sydney, and is a delightful township. It has a very wide main street where cars park at right angles to the kerb - reverse in, drive out in NSW. There are quite a few very varied shops - bakers, a pie shop with delicious Crookwell pies, newsagents, a supermarket, florists, farm supply merchants, etc, etc. There is a sock shop attached to a sock factory - I try to buy a pair of brown socks each visit to help support local business. As you drive away from Goulburn, towards Bigga, Lynams is on the left hand side. There are several places to have a cup of tea, but we usually stop at Lynams as it has the most character. It's just a little old fashioned - nothing wrong with that in my book - but there are lots of tables, and you get a good pot of tea, and a good choice of cakes, etc. They also do meals. 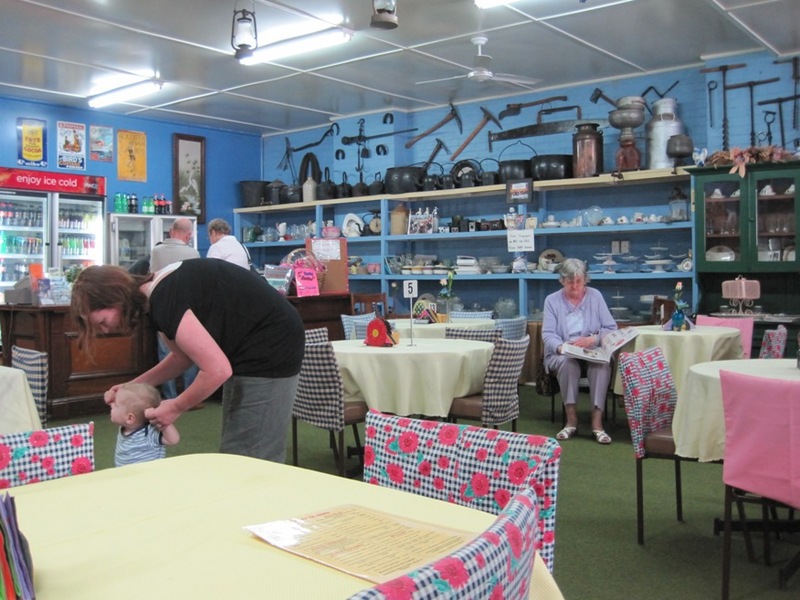 As you can see from the picture, there are all sorts of curios and bric a brac on shelves all round the tea room. Sadly none of this is for sale. We usually find a table, place our order, and then wander round looking at the displays until our tea is served. One slight criticism. In Nov/11 we ordered tea for 3, and got a large tea pot but it only contained 5 cups - so only two of us got a refill. But I'm sure they would have topped it up if we'd asked. I doubt if many reading this will visit Crookwell, but if you do, be sure to have a cup of tea at Lynams. We were in Crookwell in December, 2012. Lynams was still open, but we didn't have time to visit. Sadly we noticed it was up for sale in an estate agent's window. In February, 2013 we got an e-mail from our son Jamie to say that Lynams had closed at the end of January. There was to be an auction of all the memorabilia in a local hall in February. It's very sad. We will need to see if we can find another tea room to recommend. Times are hard, and Puddleducks have been struggling for some time. My friend Martin sent me an e-mail just before Christmas, 2011 to say that Puddleducks had closed, but "The Willow" was a very nice place, not too far away. I have just left Puddleducks here in case it opens again, and until I can investigate "The Willow". Thanks for the update, Martin. Thanks once again to Martin from Buckie who sent me the photo. That's two photos that Martin has supplied - the other one was Aurora in Buckie. Not only that, Martin has recommended several tea rooms that I look forward to visiting, and as mentioned above, advised that Puddleducks is no more. Cullen is a little fishing / tourist village on the North Coast of Scotland about 5 miles east of Buckie. It has a lovely little harbour. If you face the sea, Puddleducks is on the right hand side of the main street, just a few yards down the hill from the main square (and parking). Puddleducks used to be part tea room, part gift and craft shop. It used to be well worth having a look round the shop. It is a lot bigger inside than it looks from the outside. The food is good and so are the prices. This would also be a good stop for a light lunch. In August 2007, when Puddleducks was up for sale, I wrote that hopefully Puddleducks would survive and still be a recommended stop. We visited again in June, 2009, and Puddleducks was still there - but was now called Puddleduck Patch. 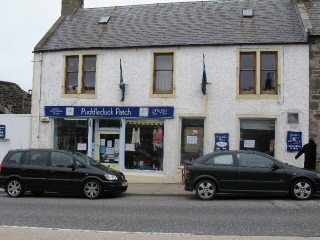 As 2010 closes, Martin in Buckie has advised that the owner of Puddleduck Patch has been and gone. But the shop is still open, is again called Puddleducks, but is purely a tea room now. Crucially you can still get a good cup of tea there. Small tea rooms in small villages must find it hard going in their fight for survival. I wish them all luck, and drink as much tea as I can. Do join me, and let's try to keep all the deserving places open for business. Sadly the place closed just before Christmas, 2011. Hopefully it may open again. However, when we revisited Cullen in 2013 what had been Puddleducks was now a vets practice. The picture was taken in August, 2010. When we visited Kirriemuir in August, 2016 we found a lot of it was closed and boarded up. Surprisingly this tea room was still open but now called "Grannie Annie Mays". As we didn't go in, we don't know what the place is like, so I have moved the write up pending a future evaluation. Kirriemuir is a nice little place about 40 plus miles south of Aberdeen. It was the birth place of J M Barrie, creator of Peter Pan, and of course you can visit Barrie's house. There is a sad story told in the house of a brother of Barrie who died when the brother was very young, and so who remained forever young. There is a very good small museum in the centre of the town well worth a visit. There is a statue of Peter Pan in a small square opposite the museum. Standing in the square with the museum behind you, the Angus Fine Art and Tea Room is up a bit, and on your left. This tea room is a genuine Art Centre where there are various rooms with paintings, prints, etc on display and for sale. Lots of tea rooms have the occasional painting hanging on a wall with a price tag attached, but this place is definitely art shop first, and tea room second. But I guess there is not much day to day demand for works of art in a small place like Kirriemuir, and so unfortunately this shop only opens a few a days per week. If it is open, though, do visit for a cup of tea, etc, and do have a look at some of the work of local artists - but there are not many bargains unfortunately. The last couple of times we have visited Kirriemuir, this tearoom has been closed - it only opens some days of the week. So we have recommended The Auld Surgery Tearoom as an alternative. The "Auld Surgery" has an interesting history, and is worth a visit in its own right - see below. But sadly the Auld Surgery was closed and boarded up in 2016. When we visied in August 2016 we found that a lot of Kirriemuir was closed and boarded up. There was some scaffolding up and some work going on, so perhaps the place is being redeveloped. Anyway, The Auld Surgery was dusty and closed. I had already recommended Angus Fine Art and Tearoom as a place for a good cup of tea in Kirriemuir. However this changed in 2016 to "Grannie Annie Mays" and we have never visited the new set up. ! 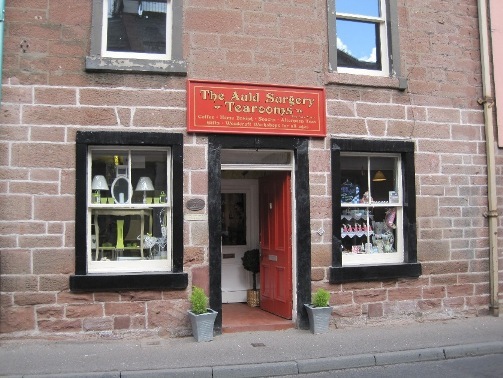 The Auld Surgery Tearoom is at 17, Bank Street, just a short walk away. The centre of Kirriemuir is very compact, and you won't have any problems in finding Bank Street. The Auld Surgery tearoom is a fair sized place, with lots of little rooms. When we visited in 2011, they were still serving jam in a separate pot, and I enjoyed an excellent home cooked cherry scone. I thought the pot of tea was a little on the small side, but there was enough really - and I'm sure they would have topped it up with boiling water had I asked. I should have asked, shouldn't I, to test the place properly, but I've since been told that they would be delighted to do this. We sat in the front room where they were doing running repairs to a table that had seen better days and had a wonky leg - don't we all. It was a little noisy for a minute whilst the electric drill did its work, but it was soon over, and normal service was restored quickly. The Auld Surgery building dates back to 1800. I thought I had read that it was a bookshop initially, and then a doctor's surgery for a long time, and then was renovated and re-opened as a tearoom. However two people - firstly Louise, and then Arlene - have sent me e-mails to correct / add to what I had said. I love it when anyone contacts me, thanks Louise and Arlene. Although Louise didn't know that the place had been a doctor's surgery she did advise that formerly the premises had been operated as a tearoom and second hand bookshop run by the local baptist church. Louise also told me of rumoured connections with JM Barrie. "The building was built circa 1800 and belonged to a local plasterer James Mills whose son went on to establish a bookshop and printers (it is said that J.M.Barrie had his first introduction to literature here) it is for this reason that the building is on the heritage trail. In the mid 1800s the building was owned by the local doctor and was a doctor's surgery with living quarters above for almost 100 years. The last doctor there was Dr Rattray, we still have customers coming in to this day who remember the surgery, Dr Rattray's family visited from Canada last year and had fond memories of the building. I am fairly sure it was a doctors until circa 1960. It was not until much more recently that the Free Baptist Church bought the building and ran their Pilgrims Tearoom downstairs. They had to close as it was proving to be non-profitable. Almost 3 years ago my sister in-law and brother approached the church and now lease the ground floor. When they renovated the place the doctors inspection lamp was still attached to the wall.... hence 'Auld Surgery' ". It's me again, now. I think it's lovely to know a little of the history of the place where you live. The house where I live was built in 1900 - it says so on the wall - and was one of two cottages occupied by spinster sisters. It then shared a common privvy at the foot of my neighbours garden, so my house enjoyed very necessary rights of access over the nighbouring garden to get to the privvy. Some time later all of this was changed, but we still have a peculiar boundary line reflecting compensation for the loss of access. I wish I knew more of my house's history - but of course , all of this has nothing to do with tea rooms - I am easily side-tracked. 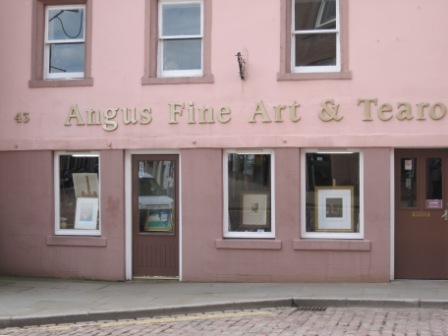 As an infrequent visitor to Kirriemuir, if I found Angus Fine Art and Tearoom open, I would probably try there first to look at the pictures and have a cup of tea. If closed, I would go to the "Auld Surgery". And if I visited Kirriemuir more often, I think I would probably visit the "Auld Surgery" as often as "Angus Fine Art and Tearoom"
The picture was taken in August, 2010. The entrance is to the right just out of the picture, and the restaurant / tea room is the annex shown on the left. A favourite, very scenic car trip from Aberdeen is to head inland following the river Dee, up Deeside to Banchory, Aboyne, Braemar etc. But for the first 10 miles or so, if you take the main road, the North Deeside road, you have to pass through Cults, Milltimber, and Culter - suburbs of Aberdeen - before you get to open countryside. An alternative that we often use is to take the B9119 road towards Tarland and you are in countryside faster. The B9119 runs parallel to the North Deeside road, but some miles further north. So head out from Aberdeen along the B9119, go through Echt, and Millers Visitor Centre is a few miles further on, on the left. 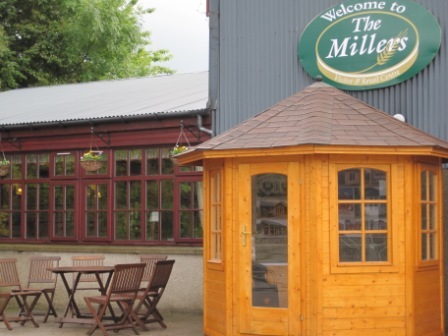 We have been visiting Millers for years, and have sometimes managed to be there when there is a sale on, and got some real bargains in the way of clothing. Its all quality stuff, but usually very expensive. They also sell gifts, groceries, farming hardware, equestrian items, books, etc, etc. It's well worth a visit. But we don't often have a cup of tea there for two reasons. The main reason is that it's too soon after setting out from Aberdeen - the plan is usually to go further inland before having refreshments. The other reason is a silly one really. Years ago we had a pancake there that was cooked on a griddle by a young waitress while we waited, but alas the girl was a poor cook, and the pancake was stodgy and undercooked. When we visited in August, 2010 once again we were leaving without stopping for tea, but when we got to the exit we discovered that outside was a torrential downpour and our jackets were outside in the car. So, we thought we would have a wee cup of tea and wait for the storm to pass. It's a very nice barn like tea room / restaurant, with a high roof and lots of well spaced tables. Our idea was to be good, and only have a tea, with no food. But when the waitress came to serve us, she arrived with a huge trolley which was laden with all sorts of goodies - cakes, scones, pancakes, biscuits, shortbread, fancies, etc, etc. How could we resist. We had a chocolate scone each - a big, tastry treat which looked like a treacle scone, but had lots of lumps of chocolate throughout. Delicious. There is a huge picture window at the side with bird feeders outside, and lots of wild life to look at. There are also binnoculars for general use. Its a very nice place , in a good setting, the tea and treats are tasty - so, all in all, a confident recommendation. The picture was taken in June, 2010. In March, 2017 we noticed that La Croute was no longer there, but a different tea room called The Coffee Nut occupied the site. A sign on the door said that the tea room was only open from 12 noon to 3pm, Wednesday to Saturday. I can't recommend such a set up. In September 2018 The Coffee Nut of Ryde was still there, and open, and looked a really nice place, but we had already had our morning tea. Perhaps we will revisit ? We usually visit the Isle Of Wight once a year, and some years we even visit twice. We always stay in Shanklin. We used to go there years ago when the pier was still standing, but alas, there was just one storm too many ! Our favourite pub in Shanklin is the Chine Inn, a very friendly, old fashioned proper pub with no loud background music, no huge TV with football, etc. Just a nice pub with good beer. But I digress. No where on the Isle of Wight is too far away for a quick visit, so most holidays there we manage to fit in a trip to Ryde. Free parking is a bit of a problem, but we usually park on the hill that descends into Ryde as you approach from Shanklin - this was still free last time we visited. The main street in Ryde is Union Street (same as Aberdeen) and this runs at right angles to the sea, up a hill to Ryde town centre. 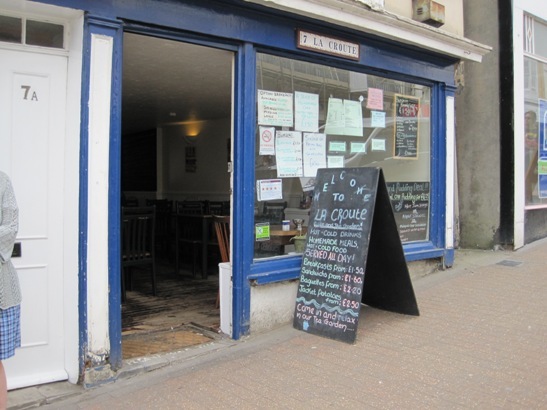 La Croute is on the left hand side of Union Street as you ascend the hill with the sea at your back. There are lots of good tea rooms on the Isle of Wight, each probably better than La Croute, so why recommend it. Well its always been there, it is a friendly little cafe, and the prices are rock bottom. Its value for money plus. It sounds very posh - La Croute - but its definitely not a posh place. You do get a hot mug of tea and a teacake or equivalent for less than the price of a cup of tea at most other places. In March, 2015 a mug of tea, a mug of coffee (instant) and two toasted teacakes cost only �3.90. That said, elsewhere on the Isle of Wight we had the same round but with proper filter coffee for �3.00 - incredible ! There is a toilet out the back, round the corner, in through the kitchen, and on the left hand side, but whilst it is clean enough, it probably won't have a lock on it. Probably better not to bother and wait until later. I have just lifted this photo from the internet - hope no one objects. Fore street is the main street in Sidmouth, and Trumps is on the right hand side as you head towards the sea. We have visited Sidmouth lots of times through the years, but our first visit to Trumps was in Feb, 2014. Sidmouth is less that 30 miles from Teignmouth where we stay for our Devon visits to see our grand daughters Chloe and Alice (and their mum and dad of course). It's strange that we haven't visited Trumps before. Why ? 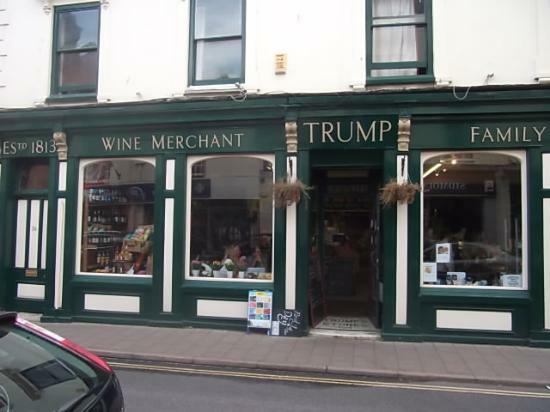 Because Trumps has been trading on this site since 1813 - mostly as a general provisions store / grocers ! Its a genuine old fashioned kind of place, with lots of very old fittings still in place. There are tables dotted around to the left of the shop. They serve tea, scones, and light lunches. It's a charming place. Most of the staff (and they did seem overstaffed when we were there off season) seemed to be nearing pensionable age - but there is absolutely nothing wrong with that. I got a good pot of Assam tea - so called speciality teas cost the same as other teas - and it was served as loose leaf with a separate tea strainer. That is how we usually make it at home, and that is how I prefer it, but I must admit using a tea bag does allow tea bag removal to prevent stewing. Service was very friendly. We didn't expect it to be quick, and it wasn't, but so what in an old place like this. One word of advice - if you do visit. When you go to pay, have a rough idea of what the bill should be. Our bill came to a lot more than it should have been, so I questioned it, and the old chap who served me confessed that he had pressed the till too many times. He was just back from holiday, so brain was not yet fully engaged, it was all done with humour, and was sorted easliy, and caused no offence. But he might still be there, and might have had another holiday. When I got my �4.50 overpayment back, the same chap gave me a 20p coin instead of a �1 coin in my change in a further error. Someone had put a a 20p coin in the �1 section of the till. Once again, I didn't mind, no offence taken - it was an honest mistake - but keep your wits about you "just in case". Christine had coffee with several free top ups whilst waiting for me to finish my pot of tea. A very friendly, very old fashioned sort of place, and we will lose these places if we don't support them. So I have added Trumps to my listing, even though we have only visited once. When we visited Stonehaven in 2017 we noticed that Maggi Mays was now called Nikki's, but didn't even look to see if it was still a tea room. We haven't visited this place since 2011, and much prefer The Waterfront Cafe Bar . In short it was time to delist the place. I had a picture of the old MiMi's but Martin from Buckie kindly sent me a picture of the new Maggie Mays - thanks once again Martin. Stonehaven is a coastal town on the east coast of Scotland, c 18 miles south of Aberdeen. There is town square, with parking on the square and a delightful harbour - parking at the end of the quay, then to the left. Its a good idea to park at the harbour, and walk along the walk way into town - so that you will be ready for your cup of tea. (There is an excellent local butcher McHardy on the town square. Its from here that we bulk order pies to take back down south with us). 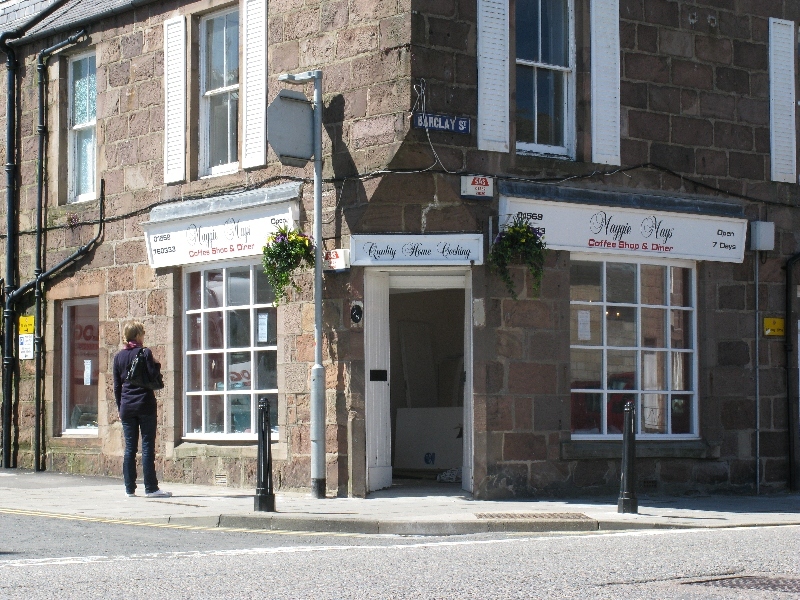 Maggie Mays (it used to be called MiMi's) is on the Market Square in Stonehaven town centre. It is on the right hand corner of the square if you stand with the sea behind you. It gets very busy in summer, so you may not get in (but there are lots of other places to get a cup of tea if you are out of luck - eg the Waterfront Cafe Bar, as below, on the main street). MiMi's used to be just a little bit on the expensive side, but you got a good cup of tea, etc, and 2 different kinds of jam with your scone. Lots of cakes, scones, etc, and everything is presented and served very nicely. When we visited in August 2007, MiMi's had changed its name to Maggie Mays. It seemed as before, but perhaps they had trimmed prices slightly, and also slightly reduced quality - for example the jam with your scone was now a single plastic sachet. Its still a good place but perhaps good rather than very good. Martin from Buckie visited Stonehaven in June 2010, and later told me that Maggie Mays had been closed for a refit, but had a grand re-opening on June 2nd. When we last visited in August, 2011 it was open and looked much the same as before, but we went to the Waterfront for our tea - see below. Arduthie House in Ann Street is also nice. Date of last visit : 2011, but still there in 2016. We have visited Teignmouth many, many times through the years. We used to come when the children were young, and now we take our grandchildren. Doesn't time fly ! Now that our daughter lives in Newton Abott, we visit Devon several times a year, and usually stay in a self catering apartment on the sea front which has a large bay window, and lovely sea views. Teignmouth is a nice, small, old fashioned, quietish, English seaside resort. There are lots of cafe's and tea rooms in Teignmouth - and none of them are very expensive. We don't really have a favourite - we visit quite a few. However I have recommended tea rooms for most of the surrounding places, and so I thought I should really add one in Teignmouth itself. 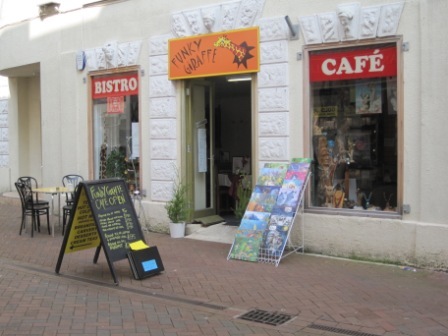 The Funky Cafe is on the main pedestrianised street in Teignmouth - on the opposite side of the road from the Co-operative supermarket. The road runs parallel to the sea front - go directly inland from the pier, and turn left. Normally I would avoid a place with the name "Funky" - not quite me, really - but in late January, early February, 2011 most of our family happened to be in the same place at the same time. This was a rare event - Jamie and family were over from Sydney, and Kirsty and family were visiting from down the road (Newton Abbot). We did get some very good weather for the time of year, but the particular day we were all in Teignmouth was bitterly cold with a cruel wind, and so we all rushed into the first cafe that we chanced upon, and it was more than OK. This was the Funky Cafe. The quality was excellent, and the total price for teas, coffees, scones, cakes, for the whole gang of us was so cheap that I thought perhaps they had made a mistake. We have also visited the place just by ourselves. They had a special offer (March,2011) of tea (or coffee) and a cake for �1.75, which we tried. Normally with such offers you only get a small slice of bought cake, but we got two huge slices of home made coffee and walnut cake, and a good, large pot of tea and a good coffee. Excellent value. The right hand side of the shop sells miscellaneous pictures - and for the first time we saw someone enter the shop, and buy a picture. Most of the pictures I thought I wouldn't give house room, but the one bought was OK.
All in all, worth a visit, but it would be better if the place had a view. It also seemed a bit gloomy - maybe it gets the sun sometimes, but not when we were there. Thaxsted is a charming little town / township in Essex, not far from Dunmow, about 10 miles roughly east of Stansted airport. It's a nice place to aim for when taking visitors for an afternoon drive in the countryside. It has an ancient Guild Hall, an old church with a huge spire that is visible from miles around, and a restored windmill. There are a few shops, and several tearooms - and its all very peaceful and calm. We usually park in the free car park off to the left (looking towards the guild hall) from the main road as you drive into Thaxsted. There is a good St John's charity shop in an old scout hut beside the car park - well worth a visit if it is open. A favourite walk is to do a circular tour along the main road, left at the Guild Hall up the curiously named Fishmarket Street, past some charming thatched cottages through 2 kissing gates to the windmill, then back and into the church, then out again and down Watling Street and back to the main street. Poppy's Tearoom is to the left of the guild hall, on the left hand side of Fishmarket Street as you climb to the church, or windmill. 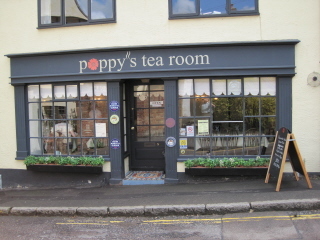 We have been visiting Poppy's for years, but I had never got round to adding it to the recommended list until we visted with two Canadian visitors (Jennifer and Carol) in June 2010. It is quite a little place but they do a wide range of teas made with loose leaf tea, and served in individual tea pots, with separate tea strainers. There is always a range of home made cakes, and the scones are very tasty, but not very big, unfortunately. Jam comes in little dishes - so much better than plastic sachets. Prices at June 2010 seemed quite fair - ie its not a cheap place, but neither did it seem expensive. Once we visited when it was very busy indeed, with people overspilling into the road and racing bicycles everywhere. We managed to squeeze in and found out that it was being used as a stage point in a cross country fun ride. So, it is a nice place to aim for on a bicycle too. There is an annual Thaxsted musical festival with the large church and its high ceiling providing an excellent venue with good acoustics. My son Jamie sang there when the Harlow Boys Choir accompanied the Harlow Chorus - both then had the excellent Michael Kibblewhite as musical director.